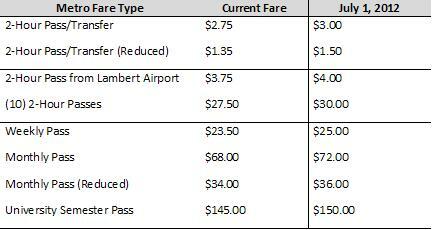 The base Metro fares will not change. MetroBus fare will remain at $2.00. The one-ride MetroLink fare will stay at $2.25 and the current $4.00 Call-A-Ride fare will remain unchanged. Reduced base fares for eligible seniors, children and customers with disabilities will also remain the same. Passenger revenue is a critical source of funding for the Metro system, and today it supports 22% of the cost to provide transit service. The cost of operating the system is continually rising because of increases in costs such as fuel, vehicle parts and medical benefit expenses. Periodic fare increases were included as a key component of the region’s long range transit plan, Moving Transit Forward. The plan calls for raising fares by a small percentage about every two years to address the transit system’s growing operating needs, while avoiding sudden dramatic fare increases. The fare increase will help financially support the existing transit system and preserve plans for service enhancements.